Snake Bight / Rowdy Bend | Florida Hikes! 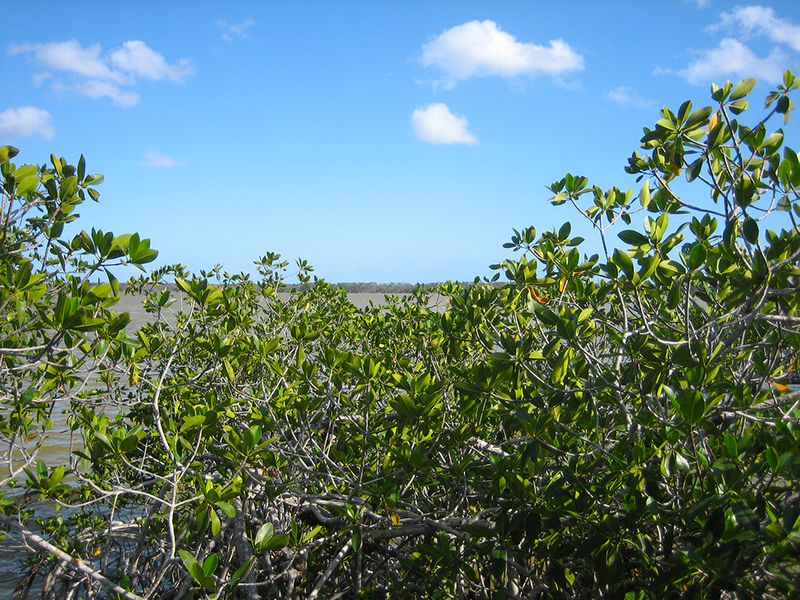 It’s a wild corner of Florida, where tropical forests meet the mangrove shorelines of Florida Bay, where crocodiles cruise the saline shallows and mosquitoes thicken the air. It’s getting even wilder these days, with the unfortunate proliferation of exotic species like pythons and anacondas. But Snake Bight has always been an outpost on the edge, a place where flamingos from the Yucatan still gather each December, scooping through mud flats to feed along the shores of Everglades National Park. This is a multi-use trail (shared with bicycles) with several options. You can take a round-trip walk out to Snake Bight, use two cars to walk 4.9 miles between the two trailheads, or do a full loop by returning along the Main Park Road. This trail has the worst mosquitoes in the park. You’ve been warned. 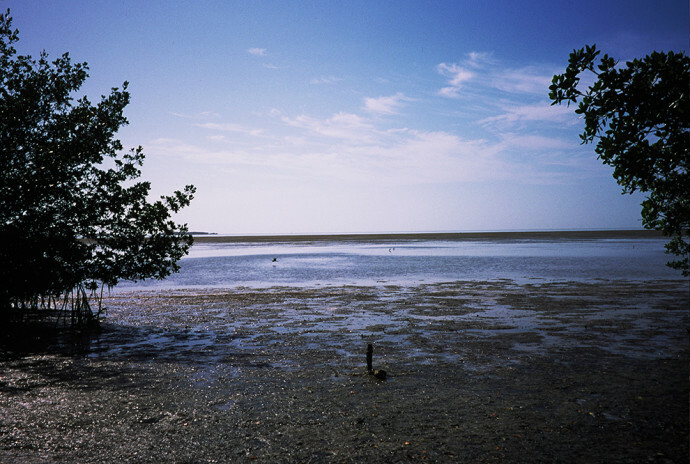 From the Everglades National Park visitor center in Flamingo, drive 5.4 miles north on the Main Park Road to the pull off for Snake Bight, on the right. If you’re leaving a car at the Rowdy Bend trailhead, it’s 2.7 miles north of Flamingo on the right; park on the grass just after the “Rowdy Bend Road” sign. 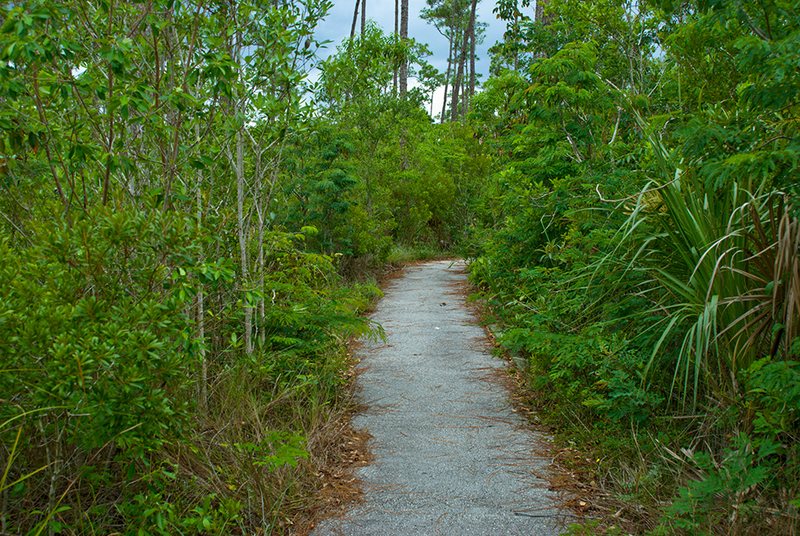 Start at the Snake Bight trailhead to walk through the tropical forest on a straight-and-narrow path paralleling the Snake Bight canal. It was once a road leading to the long-defunct E.C. Knight Fish Company processing plant, but it’s hard to imagine this ever being a road. The forest closes in so tightly you feel like you’re on an adventure, and you are. Alligators cruise the canal. Yellow nickerbean cascades from mahogany trees. 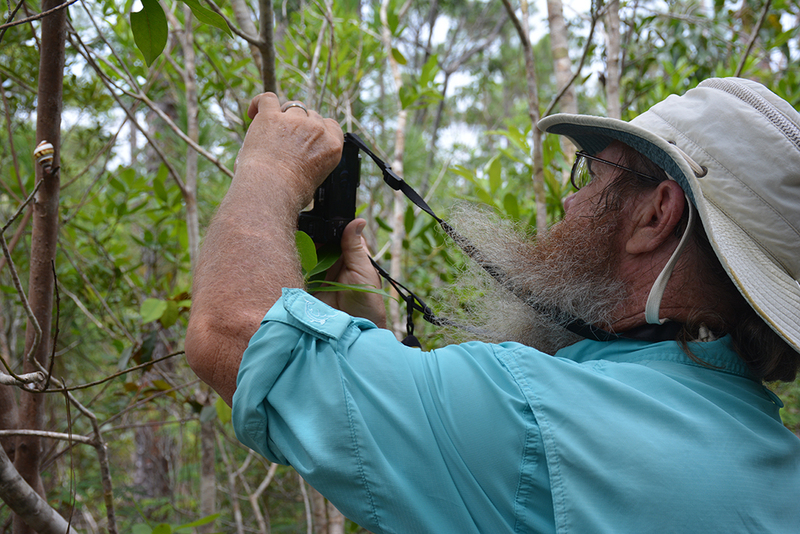 You pass a land bridge that leads to the old Crocodile Point trail system, no longer used due to the dense growth of poisonous manchineel trees through the forest. Better you stay to the beaten path. 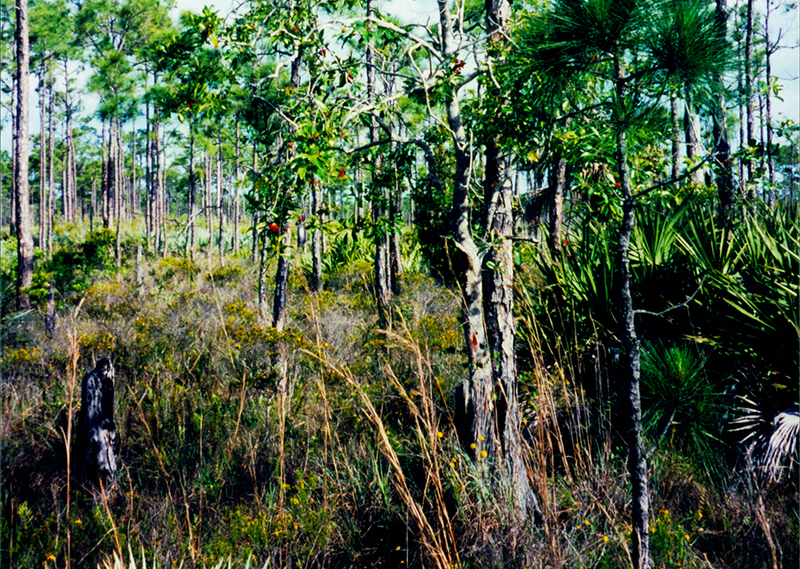 The tropical forest yields to a coastal prairie of buttonwoods and salt hay, where the air is filled with the salt tang that marks the Everglades coast and the footpath is a soft blanket underfoot. That doesn’t last long as you get into the marl, the squishy goo leading to the boardwalk at the edge of the bight. 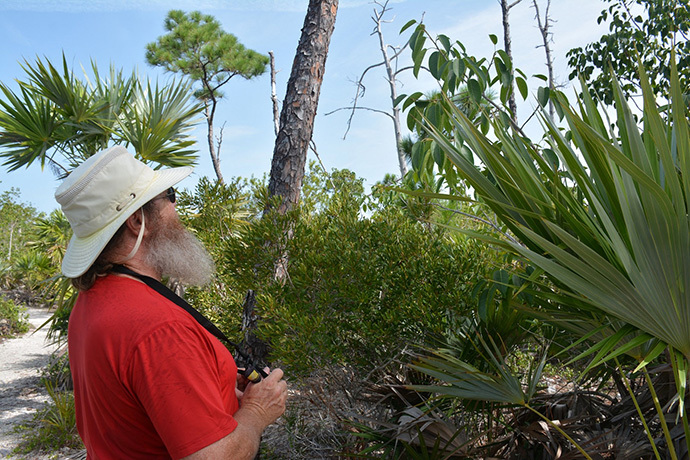 The trail ends after 2 miles at observation platform with a sweeping view of Snake Bight, a shallow inlet off Florida Bay. Scan the horizon for the slim figures of flamingos on the mud flats, and consider yourself fortunate if you see them. The flock has diminished greatly in the past century, from hundreds to only dozens returning each winter. Turn around and backtrack 0.3 mile to the sole unmarked opening on the left that leads you to the Rowdy Bend Trail. This is your decision point for doing the full loop, or returning along the Snake Bight Trail to your car. 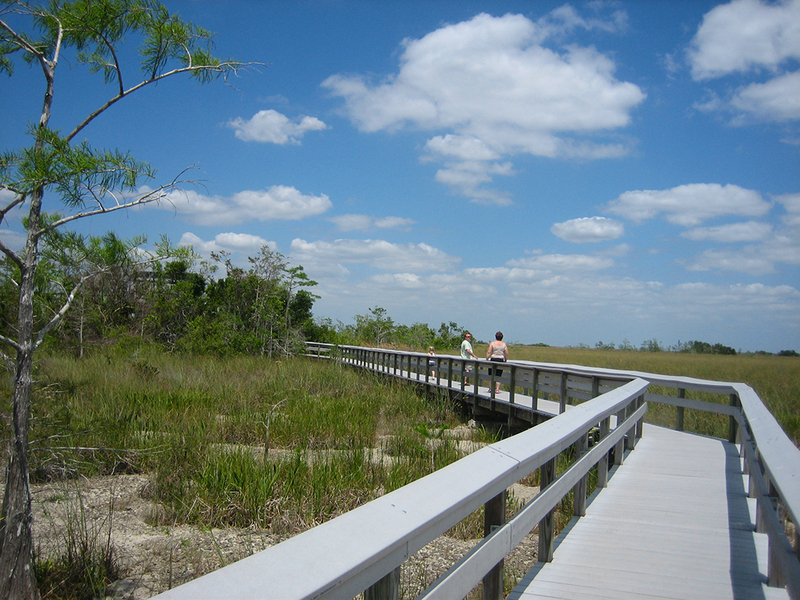 Starting out as a broad grassy path, the Rowdy Bend Trail narrows as you wind through coastal prairie and tropical hammock. Bromeliads cling to the buttonwoods. After 2.8 miles, you enter a dark tropical forest before the footpath emerges onto a vast open prairie with water holes. The footpath becomes cement-like marl, changing to a soft carpet of salt hay as the trail becomes a deep rut in the grass. The corridor eventually tightens and the footpath is full of roots as you walk beneath cabbage palms, mahogany, and blolly. Watch your footing. At 4.8 miles, the trail emerges on the Main Park Road. If you don’t have a second vehicle stashed here, turn right and walk along the edge of the mangrove-lined paved road (be alert for vehicles) for 2.7 miles, passing Coot Bay Pond and Mrazek Pond en route to the end of the loop at the Snake Bight trailhead. Hiked this trail today. Lots of downed trees from the hurricane. I read on the nps site that the trail is no longer being maintained but is still open. Cool temps and no mosquitos at all. It is impassable by bicycle because the large number of trees blocking the path. In fact we had to literally climb over a huge downed buttonwood to continue. Sorry to hear they’ve decided to abandon the trail. It’s always been a great one. I am going to try and go in Nov or Dec, hopefully the mosquitoes will not be as bad with proper protection. I would like to bike but that marl sounds pretty tough.